This Baader SCT-T adapter # 2958500B has a female SCT thread (2", 24TPI) on one side, and a standard male T / T2 (M42x0.75) thread on the other side. This short T-2 threaded adapter enables you to couple all of the T-threaded components of the Baader ASTRO T-2 System to your SCT while using a minimum of valuable back-focus distance. The short length also permits you to pair the Alan Gee II Telecompressor with the Baader/Zeiss Giant Binocular Viewer, providing incredible large-aperture wide field binocular viewing at f/5.9! The internal surface is fully sharp threaded and blackened to kill stray light reflections. Using the Ultra Short T-Adapter and Astro T-2 System, your SCT becomes the perfect platform for a wide array of potential visual and imaging configurations. The two-piece design allows you to adjust the orientation of your equipment before you fully thread in the SCT adapter. 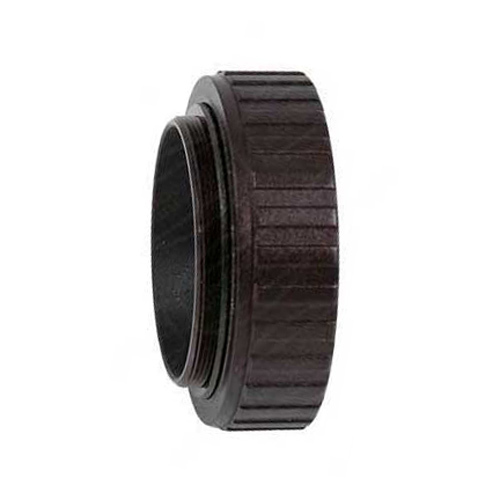 This ultra short adapter delivers the shortest possible length (10mm) by simplifying and omitting the knurled grip ring on the T-threaded portion. It includes a wide fluted surface to enable better grip and result in more secure locking onto the 2" SCT thread. A slim T thread lock ring is also included to allow you to vary the length of the male T thread (and conversely, the female SCT thread on the other side) by a small amount if required. Total adapter length is approx. 19-20mm (varies by amount of exposed male T thread. Maximum outside diameter = 56mm (2.20"). Adapter weight = 1.1oz. This is a great piece of kit for prime focus astrophotography. If you need the shortest possible light path this one is hard to beat. Review by Henry of New Zealand. The Antares focal reducer has very short FR-sensor distance requirement, so this adapter is invaluable being the shortest I could find.